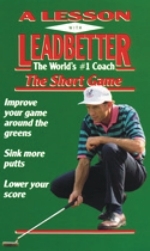 The short game is 50% of the whole game according to David Leadbetter. He has divided this video into four sections: putting, chipping, pitching, and sand play. Within these four segments, Leadbetter gives drills to improve each area. He talks about understanding the techniques used and why they are important. He videos his students before and after the lesson, then compares the results. The lessons are easy to follow and are packed with extra "Advanced Score Service" segments for advanced golfers.